An Ancient Heart Beats Again! 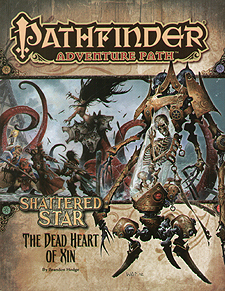 The seven shards of the Shattered Star have been recovered, and the Pathfinders prepare a grand festival on Magnimar's Irespan to celebrate this incredible achievement. The culmination of this celebration is to be the reassembly of the seven shards into the legendary Sihedron itself, rebuilt for the first time in over 10,000 years. But as the ritual to reforge the artifact is completed, ancient contingencies rumble to life, the dead heart of Thassilon begins to beat again and all of Magnimar is put in terrible danger. With the power of the Sihedron on their side, the heroes take a stand against this risen evil - but will the aid of this ancient artifact be enough to save them all? "The Dead Heart of Xin," a Pathfinder RPG adventure for 15th-level characters by Brandon Hodge. Explorations of lost cities and confrontations with ancient evils to continue your Shattered Star campaign, by Adam Daigle. A survey of the ancient rulers of Thassilon - all seven runelords detailed in one place, by Rob McCreary. The madness-inducing conclusion of "Light of a Distant Star" in the Pathfinder's Journal, by Bill Ward. Four new monsters, by Dennis Baker, Adam Daigle, and Brandon Hodge.